Overlooking an estuary in Waterview, Auckland, New Zealand, this house has great northern views out over the bay. 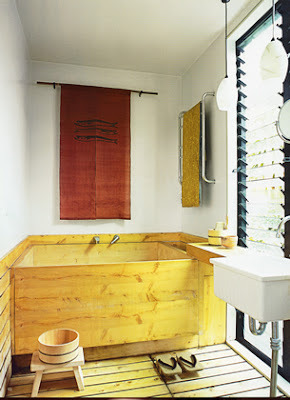 Like its owners, a wonderful blend of Japanese and New Zealand culture the house sings compact Japanese simplicity with a green Kiwi bach twist. 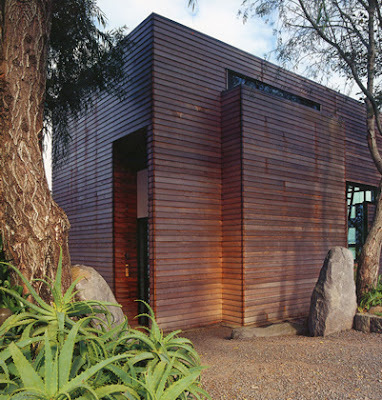 Inconspicuously blending in with the surrounding garden of imported succulents, cacti and mature local trees, the raw cedar weatherboards are a greener take on the vernacular white weatherboard planks common throughout NZ. 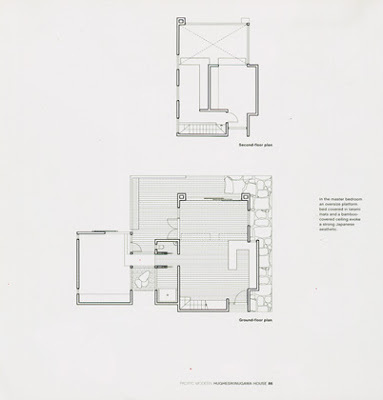 The house consists of two cubes, connected by a wide corridor housing the bathroom and toilet. The bigger brother of the two cubes holding: the eat-in kitchen, living come library and a guest loft above. Double height windows bathe the living area with light, complementing the dark bookshelves and making an optimum reading nook for the couple, which are obviously book fanatics. This part of the house, designed for guests and entertaining has a slightly more Kiwi feel about it. Logically, due to size the kitchen and library are really for intimate guests only, but the large deck area would help host bigger summer parties. Descending the stairs of the corridor, a deep traditional Ofuro, shower and separate toilet, are passed on the left. The door-less corridor has decorative Japanese prints hanging from the ceiling that tactfully block views into the master bedroom should the door be left open. The bedroom wing has a far more Japanese influence. 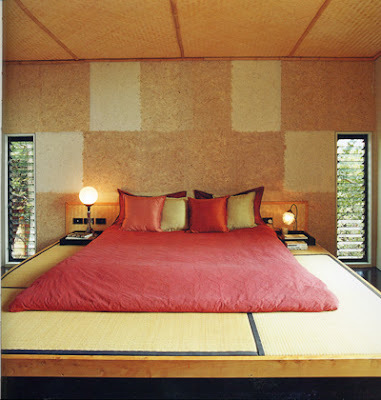 The modernistic twist though, is that rather than the floor being Tatami mats throughout, the bed has been framed with them. This room also opens out onto the north facing deck and has east facing windows to catch the morning sun. 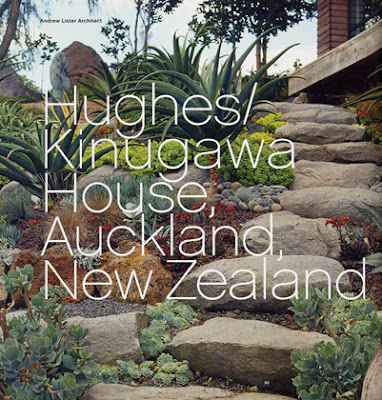 This is one of the outtakes of my Pacific Modern reading and I think a fine example of a Kiwi bach type house that would work very well as accommodation for parents.